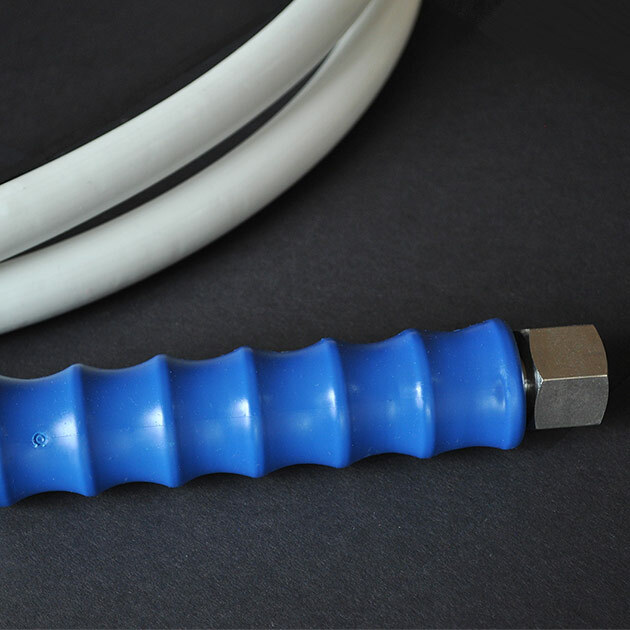 High Pressure Nutrient Supply Hoses, for industrial cleaning and hygiene. In the food industry work environments, hygiene is crucially important. You want to deliver the best possible product, so you do not want your materials, products or work environment to be contaminated by dirt and other contaminants. And you want yourself and your people to work in a hygienic work environment. So using the right and proper cleaning equipment is essential. That includes using high quality hoses. And you cannot get more high quality than high pressure hose. It gets the job done right! In short, the High Pressure Nutrient Supply Hoses is the perfect hose for any company in the food industry where hygiene is of the utmost importance! It is flexible and sturdy, can withstand serious pressure levels and is easy to handle. Ask us for more information today. Or order your High Pressure Nutrient Supply Hoses now! – You can order your high pressure hose from spec, to match the connection size and profile of your feed end and supply end, and the distance between the feed and the supply connections. That way, you can make sure that the high pressure hose meets your needs! – Or you can order a replacement. Either send us the hose you ordered in the past and we will match it, or send us the specs of the hose you want to order.